River Matla divides Sundarban Reserved Forest into Sundarban Tiger Reserve (on the east) and Reserved Forest of South 24 Parganas Forest Division. Sundarban, the largest delta in the world, consists of 10,200 sq km of Mangrove Forest , spread over India (4200 sq km of Reserved Forest ) and Bangladesh (6000 sq km approx of Reserved Forest ) and is also the largest Mangrove Forest in the world. Another 5400 sq km of non-forest, inhabited region in India , along the north and north-western fringe of mangrove forest, is also known as Sundarban region in India . 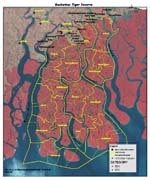 Hence, the total area of Sundarban region in India is 9600 sq km which constitutes the Sundarban Biosphere Reserve. Indian Sundarban is bound on the west by river Muriganga and on the east by rivers Harinbhahga and Raimangal. Other major rivers flowing through this eco-system are Saptamukhi, Thakuran, Matla and Goasaba. Sundarban Biosphere Reserve was constituted by Government of India (GOI)in 1989 and it received the recognition of UNESCO under its Man and Biosphere (MAB) Programme in November, 2001. Sundarban National Park , forming the core area of Sundarban Tiger Reserve, received recognition as World Heritage Site by UNESCO in 1987. It has been nominated by GOI for recognition as Ramsar Site (a wetland of international importance). 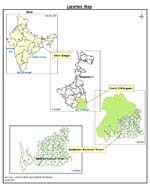 Sundarban Tiger Reserve was constituted by GOI under Project Tiger scheme, in 1973. 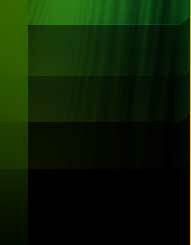 Sundarban is the only mangrove forest in the world which is the home of Tiger. Sundarban Tiger Reserve has the highest tiger population in the world. Sundarban has extremely rich diversity of aquatic and terrestrial flora and fauna. Sundarban's highly productive ecosystem acts as a natural fish nursery. 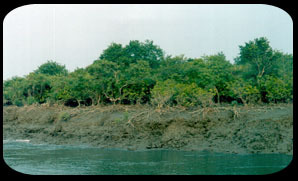 Sundarban Mangrove reduces the fury of cyclonic storm and prevents erosion due to tidal action. Finally, millions of people depend on Sundarban Ecosystem for their livelihood and sustenance through fishing, collection of honey and fuelwood/timber. 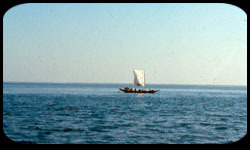 Geologically, the Sundarban delta is the largest prograding delta on the globe. 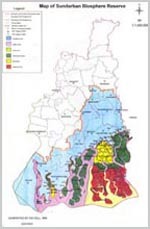 The region is covered solely by quaternary sediments carried and deposited by the rivers Ganges , Matla & Bidyadhari. Although the region is situated south of the Tropic of Cancer, the temperature is equable due to its proximity to the sea. 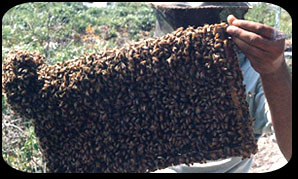 Average annual maximum temperature is around 35 C . Average annual rainfall is 1920 mm. Average humidity is about 82% which is more or less uniform throughout the year.